Here’s are PowerPoint files of my talk at the July 26, 2018 Litter Index Community Training. Logan Triangle, like many areas in Philadelphia, suffers from excessive illegal dumping. At the Logan Civic Association meeting on May 14th, local residents complained about this long term problem and asked for action. Based on District 8 Trash Task Force meetings, personal investigations and Philadelphia’s Zero Waste and Litter Cabinet information, I have assembled the attached Logan Triangle Illegal Dumping Action Plan to help focus our efforts to tackling the Logan Triangle and wider dumping crisis. Specific action plans have been developed for each of the initial 8 action areas. There are 8 Block Captains in the Triangle vicinity. They could provide valuable insight and leadership to our efforts if the Streets Department can facilitate communication between these Block Captains and the District 8 Trash Task Force. SWEEP officers have extensive experience assessing trash sources and corrective actions which can help the community efforts. Can the Streets Department facilitate communication between SWEEP officers and the District 8 Trash Task Force? Streets placed dozens of concrete barriers around Logan Triangle to limit access to the open land. This report identifies several locations where dumpers are able to bypass the barriers to dump. Specific recommendations are included to move, realign and/or remove barriers by action area. Philly311 has accepted multi-block illegal dumping requests and currently is processing requests for 3 of the 8 action areas in Logan Triangle. 4 surveillance camera locations are recommended. Can Streets and Philadelphia Redevelopment Authority expedite camera deployment to these 4 Logan triangle locations? 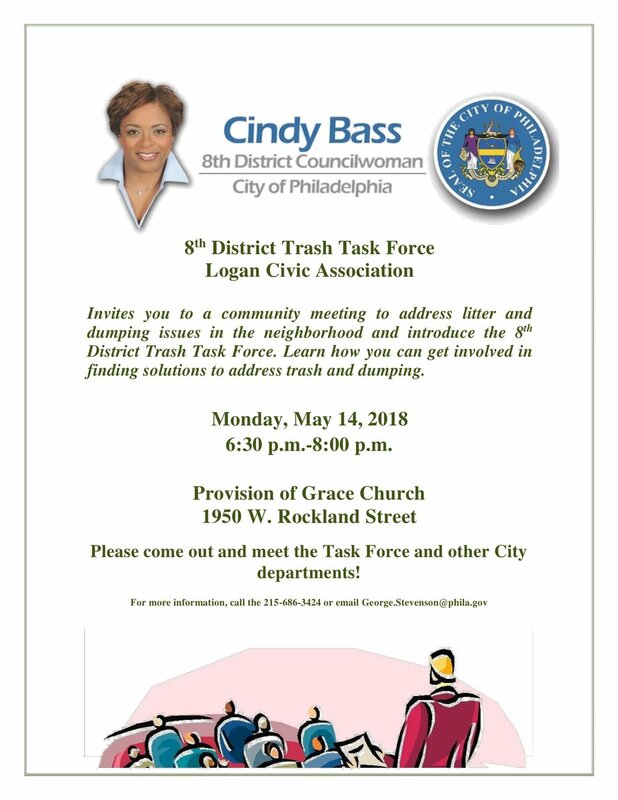 Logan Civic Association meeting on May 14, 2018 will discuss Illegal Dumping in Logan Triangle. 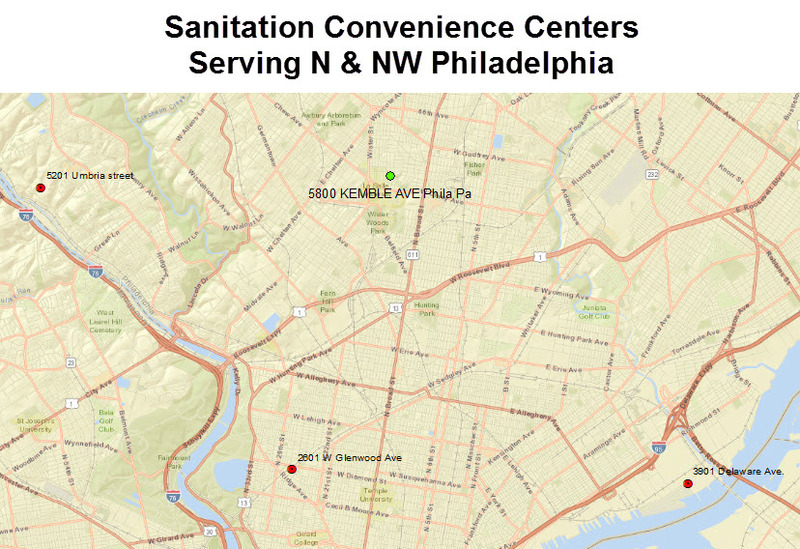 Philadelphia has 6 Sanitation Convenience Centers (SCC) that provide residents safe, free, reliable disposal sites for excess trash and special items like tires and TVs,electronics. Approximately 33% of Philadelphia Housing Units do not own or lease a vehicle, presenting a serious challenge to residents with excess trash. 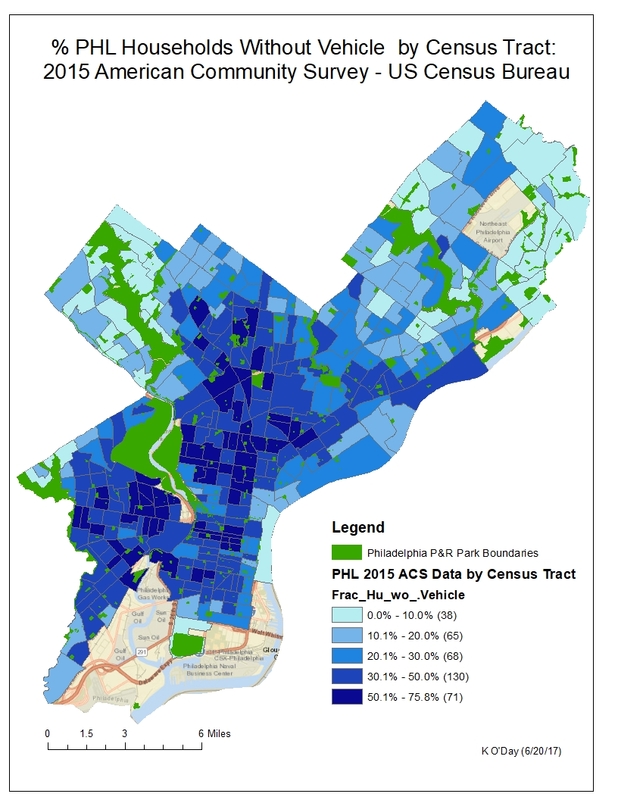 How do they get their excess trash to an SCC?This map shows the of % households without a vehicle by Census Tract. More than 50% of households do not have a vehicle in 71 census tracts. Residents how do not have access to a vehicle so that they can not use the City’s Convenience Centers without borrowing or renting a vehicle. We may need some type of trash taxi service for those households without access to a vehicle. For those households with a vehicle, travel times from residents’ home to an SCC and back can present a significant time challenge. The following map shows the estimated one-way travel times areas for 5, 10 and 15 minutes trips. I think that a 15-minute one-way travel time (30 minutes round trip) is the upper limit for residents to transport excess trash to a SCC on a regular basis. 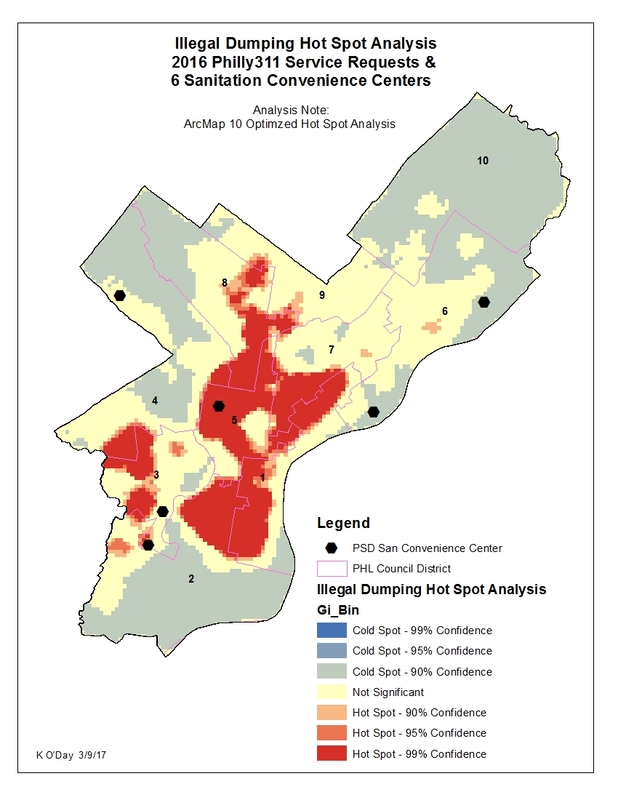 My most recent report on Philadelphia Street Trash includes this hot spot analysis of Philly311 Illegal Dumping Service Requests. You can download the report here. Illegal dumping is a growing problem in Philadelphia (link)! We need to understand types – locations – frequency of dumping to stop it. We have the data, we need better data analysis to effectively manage our trash problem. 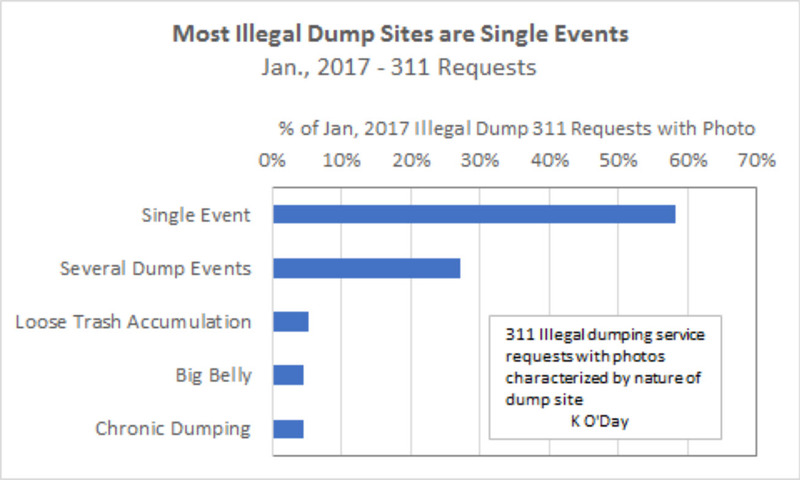 Here are 3 charts that demonstrate how we can diagnose our trash dumping problem using January, 2017 311 illegal dumping service requests where citizens submitted photos. Here’s what we can learn by studying the January, 2017 illegal dumping service requests. Residential trash (36%) was the most common type of dumping request, followed by tires and construction debris (12% each), mattresses (10%), mix of trash types (9%) and TVs (7%). 66% of illegal dumping requests occurred on sidewalks, followed by 15% on/near vacant lots – buildings. 58% of dumping requests occurred at single event sites, 27% at multiple event sites ad 5% at chronic dumping sites. Big Belly’s accounted for 5% of Philadelphia illegal dumping service request sites. Loose litter accumulation accounted for 5% of Philadelphia’s 311 illegal dumping service requests. Philadelphia’s 311 OpenData is an excellent research tool to investigate our street trash problem. Philadelphia has used data to fight crime (link) for a long time, it’s now time to use Philadelphia’s 311 data to fight street trash! We have many of the basic tools necessary for implementing a state-of-the-art street trash management system comparable to our crime data system. We need to increase the City’s focus on street trash and integrate our many resources into a concerted program to address this chronic problem. In this post I want to show how the City’s 311 data system can be used to better understand our street trash problem and identify potential control strategies based on resident provided street trash data. There were 1,277 illegal dumping service requests in January, 2017 (link). My earlier posts showed that illegal dumping service requests are increasing and that illegal dumping requests are increasing as a portion of all 311 field service requests (link). What can we learn about the types and locations of trash being dumped? We can use the photos submitted by 311 users to classify the requests by type of trash, dump site location and dump situation conditions. That’s just what I did. I downloaded the 1,277 January, 2017 illegal dumping service requests from OpenDataPhilly, selected those requests that had usable photos (302 ) and then classified request by Trash Description, Dump Location Description, and Dump Site Characteristics. Here is a link to my on-line Google Sheet where you can view the classifications and check out the photos. Click the Link field to view the resident’s submitted image. A new window will pop up showing the actual url with a small arrow . Click the arrow to navigate to the resident’s image. 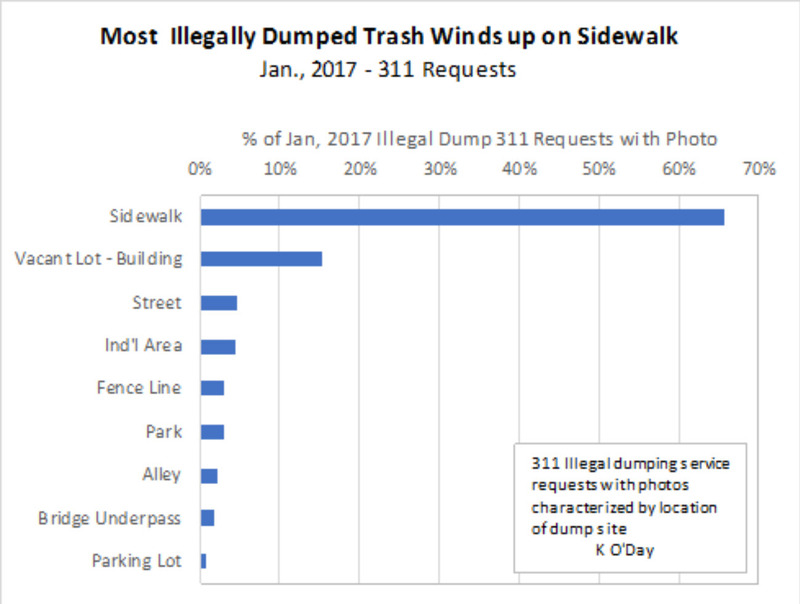 In my February 2nd post, I showed how Philadelphia’s Illegal Dumping 311 requests have been rising since the City started systematic data collection in 2015 (link). 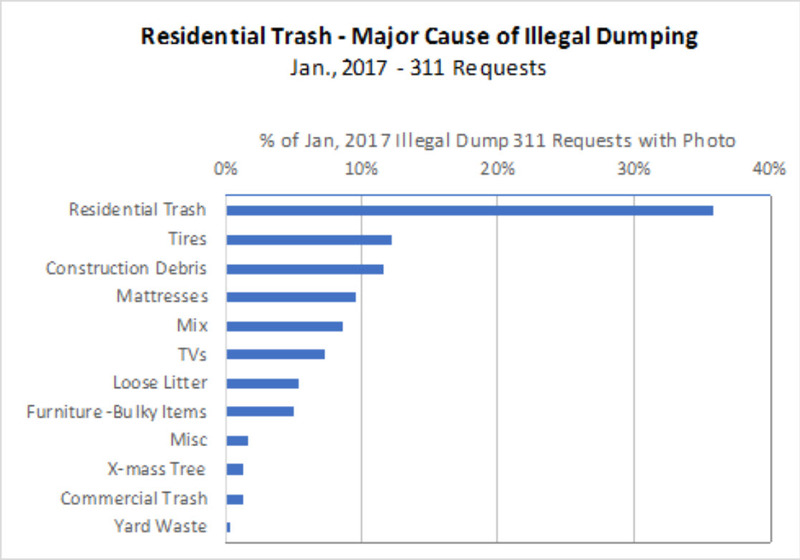 Philadelphia’s 311 calls and on-line requests have been growing since January, 2015, so it is fair to ask whether Illegal Dumping requests are increasing as a share of all 311 service requests. I will give a quick answer then I will explain how I arrived at the answer for those interested in the details. 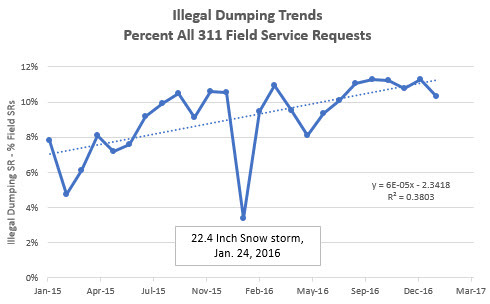 Yes, Illegal Dumping is increasing as a percentage of all 311 field service requests, as shown in the chart below. Since information and directory assistance calls are included in the 311 OpenDataPhilly file, I removed them from the 1.2 million 311 records to determine the identify the field service requests. I then computed the Illegal Dumping requests as a percentage of the monthly field service requests, as shown above. The illegal dumping trend is quite clear. Philadelphia residents are submitting more and more illegal dumping requests to 311 each month. The exception was January, 2016. It turns out that we had a 22.4 inch snow storm on January 24th which depressed the number of illegal dumping requests as residents had the pressing challenge of shoveling snow. This is just a small example of the important information hidden i the City’s 311 raw data. Now that we have a well organized 311 data reporting and tracking system, we need to move forward with a routine analysis of our 311 data to understand trends and patterns. Philadelphia Police’s Crime & Maps web page provides an excellent example of how we should use the City’s 311 data to prepare regular management reports for City officials, Council members and residents. LA is using ArcMap, dashcam, GPS and cameras to develop detailed street cleanliness index. Click this link to see an interactive Story Map of this innovative use of GIS to tackle a pressing urban problem. Cleanliness Indexes are available by 39,915 street segment and are summarized into operational grids. Philadelphia, like LA, has a serious street trash problem. We need to dramatically improve our street cleanliness efforts. Following LA’s Clean Streets Index would be an excellent start for the Mayor’s Zero Waste & Litter Cabinet. Why Didn’t TV Dumper Use One of PHL’s 6 Sanitation Convenience Centers? 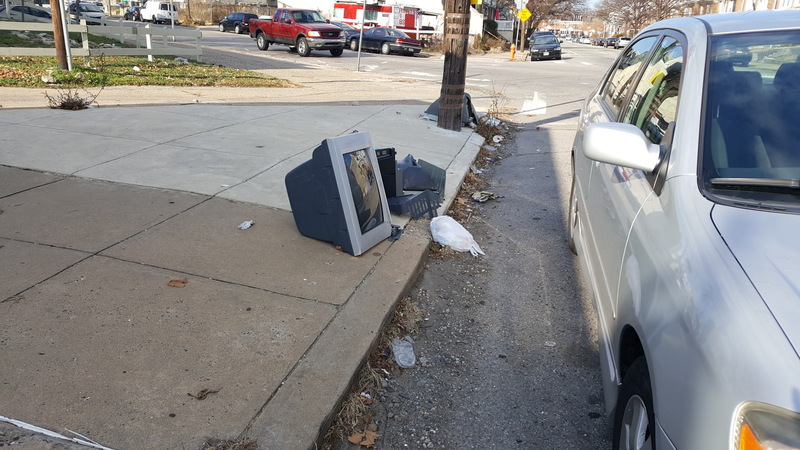 A vigilant 311 reported submitted this image at 01/05/2017 07:33:19 AM showing a dumped TV at 5800 Kemble Street. Lets look at this dump site and the City’s Sanitation Convenience Centers. Three of the 6 Centers are sjhown on this map along with the TV dump site to show the distance between teh dump site and a proper disposal site. The Strawberry Mansion and NW Center are about 6 miles from this TV dump site. The dumper had a choice, he/she could have taken the old TV to one of these stations 6 days of the week, yet chose to dump it on the street corner. Why? Many, if not most, Philadelphians are not aware of the City’s Sanitation Convenience Centers and their acceptance of old TVs and other electronic 6 days a week as well as mattresses, tires and other typical dump materials.. The Dumper knows about the City’s Centers but simply chose to dump, rather than take the little extra time to bring it to one o fhte Centers. The City’s San Convenience centers are an excellent program to try and help City residents handle trash between trash collection days. Public Service Announcements by all elected (City, State, Federal) officials in Philadelphia advising their constituents of the location of the nearest Convenience Center, days of operation and list of materials accepted. All Philadelphia Community Development Corporations and Neighborhood distribute public service announcements to their participants about the city’s Sanitation Convenience Centers. Mayor Kenney’s Zero Waste and Litter Cabinet review the success of the 6 centers and assess whether additional centers in high dump areas could help reduce illegal dumping. Mayor Kenney’s Zero Waste and Litter Cabinet conduct pilot study to see if a neighborhood based services can be provided to collect materials from eligible residents and transfer this material to a Convenience Center. This could help in those situation where resident needs help to get the trash to one of the 6 Centers.